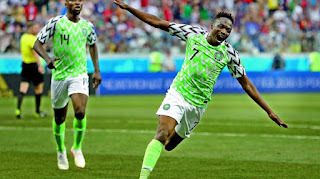 Myss Lafunky's Blog: Musa Keeps Super Eagles' World Cup dreams alive: Who is Keeping Your Hope Alive? Musa Keeps Super Eagles' World Cup dreams alive: Who is Keeping Your Hope Alive? Hi everyone, it’s been a long time, like 4 months! We sincerely apologise for the break. We are back! Please, watch out for our blog post every Monday. A lot has happened in that time, can’t begin to count but most importantly, the World Cup is here and with it a chance to see the Super Eagles in action. For the avid football lover, I’m sure you feel the excitement. Oh what a feeling when Ahmed Musa scored that first goal. Suddenly the entire team felt re-invigorated, the entire country began to hope silently that maybe, just maybe, the Super Eagles would claim their first 3-points at the 2018 World Cup. Suddenly a whole country began to believe, the doubters silenced, the believers energised at the possibility of a victory that eluded a much better team than ours. But they that wait upon the LORD shall renew their strength; they shall mount up with wings as eagles; they shall run, and not be weary; and they shall walk, and not faint (Is. 40:31, KJV). As children of God, we have the unenviable task to learn to wait, not just to wait but to wait patiently, hoping for the best, believing that sooner than later, our breakthrough shall arrive; that sooner than later, we shall overcome; that sooner than later, the light at the end of the tunnel will overcome the darkness. Despite the difficulty of this, the bible assures us that if we wait on the Lord all the things listed in the verse shall happen. That is the essence of the analogy at the beginning of this text. Just as we waited on that first goal, we should wait on the Lord, never losing hope because our father in heaven has assured us that our strength shall be renewed! Go into this week waiting on God, never losing hope, believing and trusting in the Lord God Almighty. Remember, while you're waiting on God, God is working! His plans for you are the best! His plans for you are better than your own plans for yourself. -What keeps you going when you are waiting on the Lord? Any tips to share with our Lafunkites' readers and followers? Have a great week ahead. Stay blessed. We look forward to reading from you. See you next week Monday for another post from Mysses' Lafunky's blogspot.